I’m covering Dangan Ronpa for 3 reasons. First, the Lerche power trio is involved. Second, C3-bu is a show we decided to do together as a slaparound on weekends. Third, it’s a mystery and I have no clue how it goes, so it should be fun to react to in real time. The moment a room trade was suggested, I got the feeling it would immediately become something that would end up bringing suspicion upon the main character. Anytime you take individual action without telling someone in the middle of a mystery, however trivial, it usually ends badly. Sure enough, the next morning Maezono showed up late, and turned up dead in his shower. And Naegi was inept enough to not share that bit of information with anyone beforehand and be the first one at the scene of the crime. He set himself up as a suspect like this, and he’ll pay for it in a very uphill battle during the trial. Hopefully he learns from it and becomes a more capable protagonist. The show is doing a pretty good job of managing a very large cast. One of the biggest challenges in adopting a VN into an anime is to compress several hours of characterization via text into 20 minutes of episode. So far, it’s been doing things via short focuses on most of the cast, like the scene where everybody showed up for breakfast at different times. 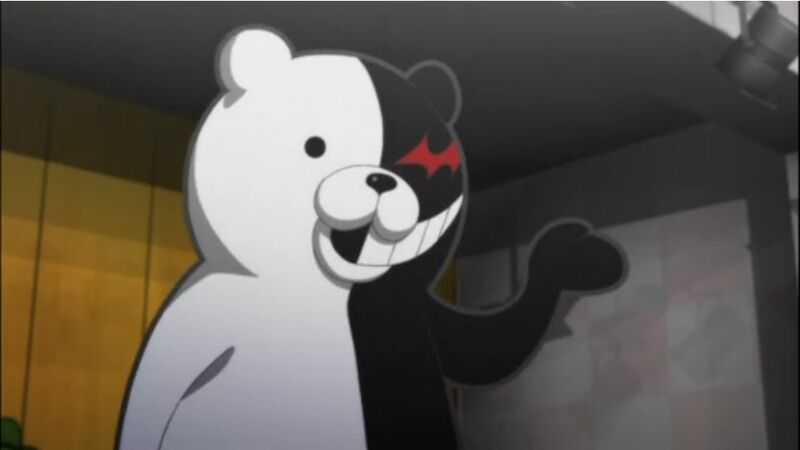 It’s a good way of adding personality traits along with clues that may or may not be relevant later, as everyone’s arrival times will probably be during the trial. It also makes the cast fun; only the literature girl fainting at the sight of blood splatter was worth a laugh. Monokuma, for his part, continues to be an extremely fun villain. Much credit to Satoki Iida for the Hanna-Barbara sound effects. That scene where Junko got stabbed to death in a flash was a great case of him being him. It will be neat to see how the trial plays out. 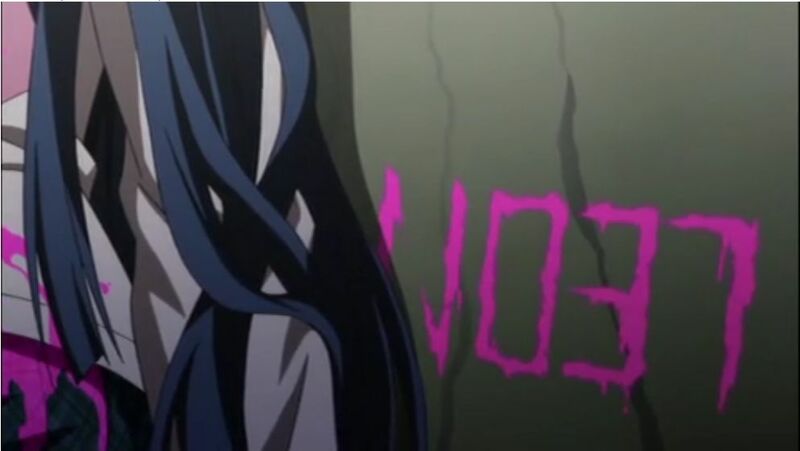 Obviously, Naegi won’t be found guilty and “my name is written on the wall of the murder scene” Leon will be guilty, but presentation will be key in making the next episode an enjoyable one. *To me, as a native speaker of English. But these kids are Japanese, so that it’s still a mystery makes a bit more sense. This entry was posted in Anime, Currently Following and tagged Anime, C3-bu, Dangan Ronpa, First Reactions, Large Cast, Mystery, Satoki Iida, Studio Lerche, Summer 2013, Summer 2013 Anime by torisunanohokori. Bookmark the permalink.